Do you want fries with that? Or eBooks, perhaps? McDonald's is a firm favourite with the Vearsa team; there's one located just down the road from our main office. Because we also love ebooks, we were really interested to hear the news of McDonald's eBook giveaway. McDonald’s is teaming up with major eBook retailer Kobo to offer free eBooks to young customers in UK and Ireland. From 30th April to 3rd June, every Happy Meal includes a voucher code to download Enid Blyton’s Five and a Half-Term Adventure, published by Hodder Children’s Books. This great eBook giveaway forms part of McDonalds’ Happy Reader campaign. Happy Reader is a joint project with the National Literacy Trust, aimed at improving childhood literacy across the UK – a good cause if we ever saw one. 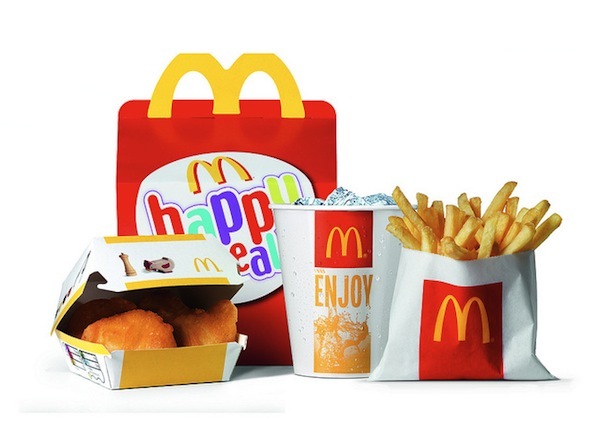 McDonald’s isn’t the first major restaurant chain to offer freebie eBooks. Since 2008, Starbucks has occasionally offered eBooks from Apple’s iBooks store as part of their ‘Pick of the Week’ free downloads programme. Titles ‘to-go’ have included teen vampire lit Vampire State of Mind by Jane Lovering, kids’ favourite You’re a Bad Man, Mr Gum by Andy Stanton, as well as Irish short story Limitless by Alan Glynn. Similarly, in January, eBooks by Sainsbury’s began offering children’s eBooks with own-brand cereal, including Tracy Beaker by bestselling author Jacqueline Wilson. It seems that eBooks are uniquely well-suited to being given away for free with food; they are easily distributed and do not require costly packaging. However, there may still be a tendency among customers to place a higher value on material freebies. Reporting on the McDonald’s giveaway, Engadget comments “we're not quite sure how "happy" we'd be about getting an eBook rather than a toy”. It’s a fair point; Happy Meal toys are prized mainly for their immediate, short-term novelty value. The delayed gratification of accessing (and reading) the eBook might be off-putting for McDonald’s younger customers. It would be interesting to find out how many customers actually download the book. Perhaps with that in mind, McDonald’s is also offering one of six Secret Seven stories in each Happy Meal, as well as a £1 / €1 voucher to use against a physical Famous Five or Secret Seven book at WH Smith or Eason. From a business development perspective, such collaborative schemes offer a myriad of promotional and sales opportunities - for both the eBook retailer and for the food brand. For McDonald’s, the scheme allows them to meet customer needs in an innovative new way. Alistair Macrow, Senior VP at McDonald’s UK, has been quoted as saying that “introducing free eBooks to the Happy Meals is another way in which we’re creating choice and keeping in step with our customers”. For Kobo, this represents a unique way of marketing eBooks. The McDonald’s customers who download the eBook represent a huge base of customers who may be new to Famous Five, to Kobo, or to both. For the duration of the eBook giveaway, McDonald’s estimates that it will temporarily become the largest children’s book distributor in the UK, according to Time Magazine. Here’s where the sales benefits lie. The giveaway will likely prompt these new customers – particularly younger customers – to repeat their custom on the eBook retail site. Children are loyal readers; if they enjoy Five and a Half-Term Adventure, they will look to similar books by Enid Blyton. It’s no coincidence that almost all the freebie eBooks offered by Sainsbury’s, Starbucks and McDonald’s form part of a series. Famous Five fans have a choice of 21 books in the series, all of which are available as eBooks on the Kobo store. If successful, the giveaway would have the benefit of encouraging childhood literacy while simultaneously boosting sales.